A fruit seller in Barcelona, Spain. Export subsidies and other similar measures are often seen as distorting global trade. The United Nations Food and Agricultural Organization (FAO) welcomed an agreement by the World Trade Organization (WTO) to move towards eliminating agricultural export subsidies, while noting that differences remain over other measures meant to create equitable global trading conditions, particularly for developing countries. “Greater participation in global trade is inevitable for most countries, however, the process of opening further to trade, and its consequences, will need to be well managed if trade is to improve food security,” FAO Director General José Graziano da Silva said in a news release. A declaration issued on 19 December at the conclusion of the Tenth WTO Ministerial Conference in Nairobi, Kenya included a number of decisions in relation to an Agreement on Agriculture, with the adoption of four ministerial decisions. The decisions addressed: competition through the elimination of many worldwide export subsidies by 2018; allowing developing countries to continue public stockpiling for food security; a Special Safeguard Mechanism for developing countries confronted with a surge of imports; and a commitment that beginning in 2016, developed countries would provide duty- and quota-free access to cotton exporters from less developed countries, if compatible with existing agreements. While welcoming the agreement through the so called ‘Nairobi Package,’ Mr. Graziano da Silva stressed the need for a global trade framework that allows countries to balance national food security and development objectives without harming their trading partners. “The continued uncertainty on how to negotiate such a framework is worrying in a world in which global agricultural trade is likely to grow in importance in the coming decades as patterns of consumption and production continue to evolve,” the FAO Director-General said. According to the report, balancing short- and long-term objectives is vitally important – especially when considering the various nature of disruptions and the likelihood that, due to geopolitical, weather and policy-induced uncertainties, market shocks would become more frequent. While efforts to intervene and shield domestic markets from global price volatility could lead to increased domestic price volatility, agricultural incentives play an important role in in boosting agricultural production and efficiency and fostering broader economic growth. While trade and food security concerns could be better reconciled in the multilateral trading system by improving the WTO’s Agreement on Agriculture, striking the right balance between better trade policy disciplines and the policy space sought by developing countries has proven difficult. The new edition of State of Agricultural Markets report argued that the best way forward may be to resolve underlying national concerns and priorities. It noted that strengthened policy coherence for food security would enable governments to improve trade policy designs, while enhancing compliance with regional and global trade frameworks. 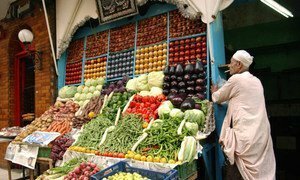 The rules governing global trade of food and agricultural products should aim to improve countries' food security and other development objectives, according to a new United Nations report issued today.